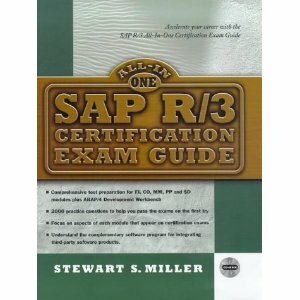 Packaged with a CD-ROM containing several hundred questions on all tracks of SAP R/3 certifications and links to special Web sites, this aims to cut the cost of qualification by including every core SAP topic. This tremendous volume, penned by enterprise resource planning (ERP) consultant Stewart S. Miller, tracks nearly all the elements involved in preparing for, taking, and passing SAP’s battery of available certification courses. In addition to offering content and context for the course and exams, Miller has taken the time to include information about the body that administers the tests–the SAP Partner Academy–course and exam pricing, and relevant contact information.It’s unfortunate that Miller doesn’t pay the same attention to the text itself, which tends to be wordy. Unlike most reference books of this stripe, the All-In-One Guide doesn’t have particularly clear or useful diagrams, nor does it provide much in the way of tables. These types of tools may not be necessary for those familiar with R/3, but for the newcomer such elements can help tie things together.Miller covers the basic R/3 modules and also touches on such issues as shifting operating systems and integrating third-party applications with R/3. Each chapter ends with several pages’ worth of questions, followed by somewhat lengthy but useful answers. All in all, this book is an effective guide to the intricacies of R/3, particularly from a study guide perspective. Page after page, Stewart Miller simplifies SAP, and helps you: Understand every part of the certification process. Save thousands of dollars on courses you don’t need, Choose the right track to meet you goals, Plan your study program, Learn the material more quickly and easily, Master the new features of Release 4.0, Practice with hundreds of questions for every test, Apply insider tips on the exams, and put your training to work in the real world.Whether you want to understand SAP’s benefits and costs in terms of running a business, get a handle on actual implementation and “going live,” or learn about those integration and functionality issues that cross module lines, it’s all here>in the one SAP R/3 credentials package designed to sharpen your competitive edge!